With ultra-modern styling, MOEN's 90 kitchen and bar/prep faucets are a study in minimalism. Geometric forms, squared corners and straight lines fuse to create an urban focal point for today's contemporary kitchens. The right-angle design of this Single-Handle Kitchen Faucet provides ample working space in your sink basin, making it easy to fill large pots. For added convenience, the pull-down spout reaches around your sink for easy, thorough cleaning with its dual-spray functionality. With ultra-modern styling, MOEN's 900 kitchen and bar/prep faucets are a study in minimalism. Geometric forms, squared corners and straight lines fuse to create an urban focal point for today's contemporary kitchens. The right-angle design of this Single-Handle Kitchen Faucet provides ample working space in your sink basin, making it easy to fill large pots. For added convenience, the pull-down spout reaches around your sink for easy, thorough cleaning with its dual-spray functionality. Weymouth Spot Resist Stainless One-Handle High Arc Kitchen Faucet Weymouth's gracious design details and distinctive Victorian finishing touches present a sense of uncommon luxury for today's traditional kitchens. 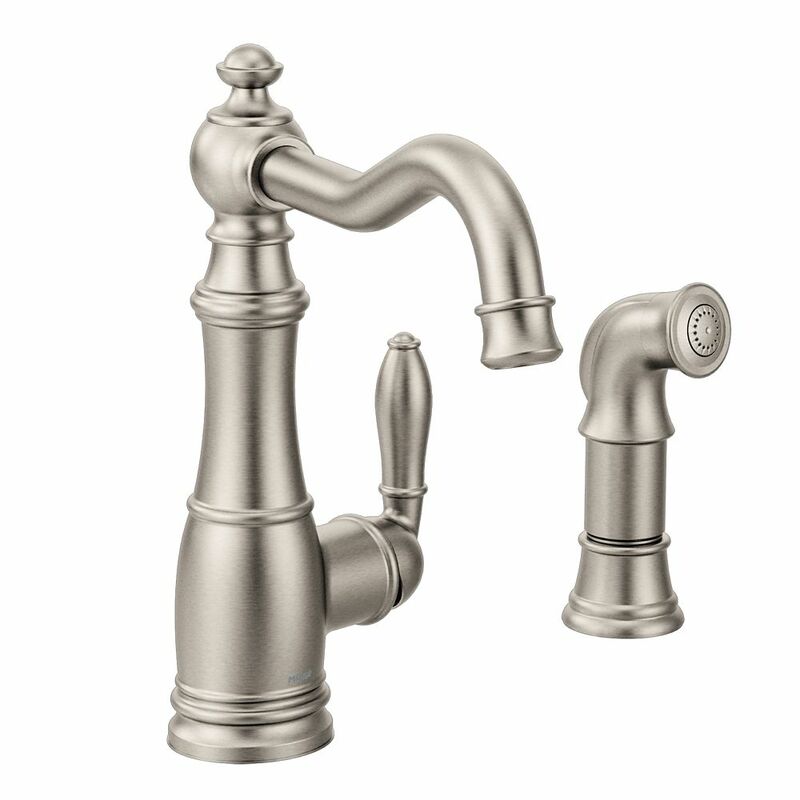 Signature styling elements include a decorative top finial and a refined shepherd's spout. Weymouth Spot Resist Stainless One-Handle High Arc Kitchen Faucet is rated 4.1 out of 5 by 11. Rated 4 out of 5 by HomeOwner from Easy to install and works great. The handle was loose when I installed it, and I had to research ... Easy to install and works great. The handle was loose when I installed it, and I had to research the online materials to tighten the handle. Rated 5 out of 5 by William from It looks great and is high enough to fit large... It looks great and is high enough to fit large pots underneath, and can complete swivel out of the way. It is not a cheap plastic faucet like so many others, and it is chrome finished inside and out, so they did not make this unit cheaply, but it comes at a hefty price: over $500! Rated 5 out of 5 by mom from Beautiful faucet! We looked at many faucets when we redid our counters and are very happy with this one. So many faucets were too tall and/or too modern for our kitchen and this height is perfect for our center island with sink. We like the single handle on the faucet and the separate sprayer. A plumber installed it for us and commented that it was a quality product and Moen is a great company to deal with if any problems arise. Rated 4 out of 5 by KCKate from Problem, but Moen fixed it We purchased this after looking at hundreds of faucets - wanted nickel, but needed to match craftsman farm-house kitchen design, and wanted high arc. Not many faucets met my needs, but this one did, while not cheap I always figure a faucet that gets so much use is a poor place to not buy quality. Imagine my surprise when less than year after installing the spout snapped off - the actual brass fitting! Moen did stand behind it and they are overnighting me a new faucet - I will chalk this up to a unusual defect of an otherwise good company. Rated 3 out of 5 by Anonymous from Overpriced but I needed it I unfortunately needed this faucet to match existing faucets in the kitchen so I had to swallow the $600+ price tag for a $150 product. Rated 5 out of 5 by Cindi from Weymouth Faucet is Fantastic! I love everything about the Moen Weymouth kitchen faucet. The spot resist stainless finish is superb. This style looks great in our cottage/shabby chic home. The water pressure is perfect. The faucet is easy to maneuver and the height is nice for filling pots. I like the single-handle better than a 2-handle faucet. This is a quality faucet. If we had a marble countertop, we may have considered a different finish, but the stainless goes perfect in our kitchen. I've only used the side sprayer a handful of times and it works well. Rated 5 out of 5 by LCPalmbay from luxurious The chrome finish is high quality and easy to keep clean. I love the one handle to adjust the water, more convenient than a two handle in my opinion. The high arc is practical when washing large pots. The side sprayer is very useful. The traditional look would look good with many kitchen styles. I can't speak for installation, a plumber did the install. All in all a very nice faucet.